With this release, (Rautavaara) is bidding fair to become Finland's leading symphonist. (...) The Sixth Symphony is another brilliant example of Rautavaaraäs striving for a perfect synthesis of musical elements. (...) The neo romantic Cello Concerto (...) is a memorable work, superbly played by Marko Ylönen. (...) Excellent performances and sounds. Highly recommended. This is a stunning addition to the catalog. Highly recommended. 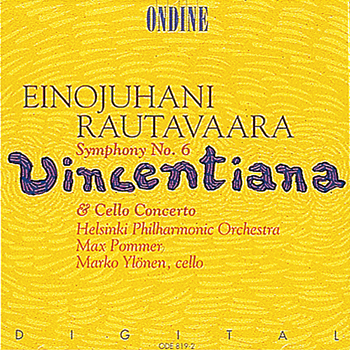 This CD couples Einojuhani Rautavaara's Symphony No. 6 "Vincentiana" with one of his most performed concertos, the Cello Concerto No. 1, which features soloist Marko Ylönen. Written in 1992, the sixth symphony is based on musical material from the opera Vincent (1985-87). The special feature of the orchestration in Vincentiana is the use of a DX-7 synthesiser, for the most part in soloist roles. Rautavaara's Neo-Romantic approach shines through the soft, mellow harmonies of the first cello concerto (1968), which in 1989 he characterized as follows: "... the music of the Concerto is a 'post-modern' combination of arm clusters, the beauty of mediant triads and even a 'Gershwinian' samba finale..."
This is the third release in a cycle featuring the complete symphonies by Einojuhani Rautavaara. The recordings were made at the Hyvinkää Hall in June 1993, with Max Pommer leading the Helsinki Philharmonic Orchestra.